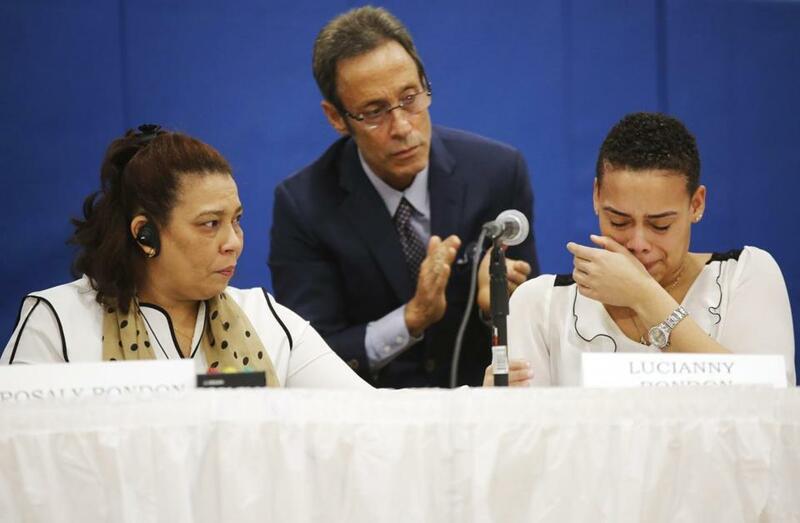 Lucianny Rondon (right), sister of the late 18-year-old Leonel Rondon, was overcome with emotion while speaking about her brother during a Senate committee hearing in Lawrence Monday. LAWRENCE — Through tears, the adult sister of the Lawrence teen killed in September when a series of gas fires and explosions erupted in the Merrimack Valley told a US Senate committee Monday that her family wants justice for her brother and the community. Lucianny Rondon, sister of 18-year-old Leonel Rondon, delivered impassioned remarks at a special hearing of the US Senate Committee on Commerce, Science, and Transportation to review the Sept. 13 blasts that claimed Rondon’s life. The family, speaking publicly for the first time, received a standing ovation from hundreds of residents and public officials at the hearing. Officials lambasted Columbia Gas, the utility responsible for the calamity, going so far as to call for resignations and even the dissolution of the company. At the hearing, members of the area’s congressional delegation accused Columbia executives of overseeing a corporate culture that prized savings over public safety. The hearing was the first public accounting of the cause and response to the fires. Markey, who called on the executives to resign, said he hoped it would lead to reforms that would prevent a similar disaster. Mayor Daniel Rivera, who also testified at the hearing, said he and the Greater Lawrence community lost trust in the company after it failed to take responsibility or a leadership role in the hours after the fires. Steve Bryant, the head of Columbia Gas, and Joe Hamrock, the head of NiSource, the utility’s parent company, appeared subdued throughout the criticism, as they sought to make amends. They said they recognized residents’ frustration with the company for causing the fires and for the bumbled response in the weeks after. Residents applauded the delegation’s criticism. “We take responsibility for the incident, and the consequences of the incident,” said Hamrock. He and Bryant both apologized directly to the Rondons. “I will carry that in the heart for the rest of my life,” Bryant told the family. Senator Elizabeth Warren, Representatives Niki Tsongas and Seth Moulton, and Senator Maggie Hassan, a New Hampshire Democrat who is a member of the Senate committee, each questioned the executives and federal and local government officials about their role in the disaster, which caused more than 140 fires and explosions across Lawrence, Andover, and North Andover. Robert L. Sumwalt, chairman of the National Transportation Safety Board, which is investigating the disaster, said a preliminary review found that the fires and explosions were caused by overpressurization of the regional gas network. Investigators determined that a construction crew replacing a gas pipeline in South Lawrence had mistakenly left a pressure sensor on an abandoned pipe and did not put a sensor on the new connection. When remote monitors detected low pressure, they cranked more gas into the system, overwhelming an aging network that connected to thousands of homes and businesses. The investigators have laid blame on an engineer who drafted the construction plans but failed to account for the need to relocate the sensor. No one else at the company had reviewed the plans, and the construction crew was not made aware of the need to relocate the sensor. The NTSB has since put out an urgent recommendation that only professional engineers, who have higher levels of training, review and approve construction plans when public safety is at risk. Last week, Governor Charlie Baker proposed legislation that would make the recommendation law. At Monday’s hearing, the senators and representatives were also critical of state and federal regulators for failing to enforce existing policies and for not requiring Columbia Gas and other utilities to follow best industry practices. Markey said that the Pipeline and Hazardous Materials Safety Administration, which has lagged in implementing national mandates that Congress approved in 2016, has been influenced too much by the industry. He called the organization a “lap dog” rather than a watch dog. But the delegation was most critical of the gas company executives, who have come under constant fire by Baker and local officials for their slow response in the hours after the disaster, and for their poor communication with residents and businesses since. More than 8,000 metered customers lost gas service, and more than 1,300 remained without heat or hot water Monday. Columbia officials initially set a deadline of Nov. 19 to restore service to all homes, but pushed that target back to Dec. 16, saying the work of replacing and repairing appliances in homes has been more complicated than anticipated. The company already replaced 45 miles of pipeline that was damaged. Hamrock, of NiSource, said the company has worked to implement new safeguards, in addition to the urgent recommendations that were laid out in the NTSB report. The company, for instance, is installing automatic valves that would immediately shut down gas flow whenever high pressure in the system is detected. Markey said the company should have already had such safeguards in place, pointing out a finding during the NTSB investigation that the company four years ago abandoned a practice of having a field technician onsite at construction jobs to monitor any work that involved depressurizing main lines. When Markey asked Hamrock whether he felt he should resign, Hamrock said he did not, because he felt obliged to ensure that gas is restored as quickly as possible. “We recognize there are things in this tragedy that we can learn from,” he said. In response to a question by Moulton, Bryant also said he felt a responsibility to continue his work as the company’s president. “This situation was absurd. Your leadership must be questioned, and this must never happen again,” said Moulton. Bryant, who made more than $500,000 last year, and Hamrock, who made $5 million, both said in response to questioning that they expected they would lose any incentive pay as a result of the blasts. Milton J. Valencia can be reached at milton.valencia@globe.com. Follow him on Twitter @miltonvalencia. Travis Andersen can be reached at travis.andersen@globe.com.